Authorities caught up with Regina Communist Party Activist Gladys Macdonald on June 3, 1940, along with two men, John Slavkowsky (whom the press identified as a Hungarian relief recipient) and Clifford Peet, another local Party organizer. According to news reports, the three, were “accused of printing a pamphlet known as the Saskatchewan Factory and Furrow, containing materials intended or likely to cause disaffection to His Majesty; likely or intended to interfere with the success of His Majesty’s forces and intended or likely to be prejudicial to the efficient prosecution of the war.” Her arrest was a serious blow to the party locally. Shortly after, an RCMP secret bulletin noted “The Communist Party of Canada in the Province of Saskatchewan appears to be seriously disorganized as a result of the outlawing of the Party and other left wing organizations and the arrests of Clifford Peet and Gladys McDonald, leading Communists.” Slavkowsky’s wife, Susie, was later charged and convicted with the trio, as the pamphlet’s printing allegedly took place in her home. Susie received a suspended sentence, while her husband and Peet received jail time of six months and one year respectively of hard labour served in Regina Jail. Apparently more dangerous, Macdonald was convicted and sentenced to double the time of Peet– she was ordered to a year of hard labour at Battleford Women’s Jail. Upon completion of her sentence on the morning of July 11, 1941, “she was informed that orders had been issued for her to be held in jail.” A short time later, “the RCMP [showed up] with an internment order on which no grounds [to hold her] were shown.” A week later, she was furnished with the particulars justifying her continued incarceration, and, over a month later on August 19, 1941, a government committee heard her appeal. Despite a host of positive character witnesses and McDonald’s own testimony that she now supported the war (in keeping with the Party’s then changed position), she did not fare well during the proceedings. By the next month, she found herself interned in Kingston Penitentiary. Macdonald’s story is part of a larger project I’m researching on the political incarceration of leftists during WWII. Then, the Canadian government imprisoned, in jails and internment camps, hundreds of far left activists. Their detention was part of a broader climate of repression, intimidation, and fear that hung over many leftists in wartime Canada. Authorities here, like other western powers, used the war as excuse to criminalize radical activism, involvement in a host of leftist ‘ethnic hall’ socialist organizations, and support of the Communist Party of Canada (CPC), which, at the time, had grown to considerable strength thanks to its Depression-era activism among the working class and unemployed. The state took aim at these radicals, focussing on the CPC’s antiwar position adopted following the German-Soviet Pact in August of 1939. Fearing disruption to the war effort and seizing the opportunity to silence Canadian radical groups (a constant thorn in the government’s side), Prime Minister Mackenzie King in the spring of 1940 banned a number of organizations linked to and including the CPC, granting state authorities the right to confiscate these groups’ property and arrest the leadership. I’m especially interested in how gender shaped wartime political incarceration. The vast majority of the men rounded up (some 120 or so) were interned, typically serving out their time together in one of three camps across Canada. Most of the women I’m finding (currently numbering around ten and growing as my research continues) were formally charged, convicted, and served jail time. Gladys MacDonald enjoys the dubious honour of being the only leftist woman internee. She was finally released, along with many of the male leftists internees then held in Hull Jail, in the fall of 1942. And after that, she seems to disappear from the record. It’s possible her name changed through marriage, and that this is making it difficult to locate further sources on her. It’s possible she may have left the movement entirely – wartime was obviously traumatic and lonely for her. I’m hoping some additional sources I’m planning to examine over the coming months will help shed light on her life and activism following her incarceration. I welcome any help Active History readers can offer. 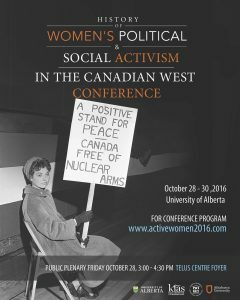 As this and the other posts in this series demonstrate, women’s political and social activism in Western Canada was complicated and complex. And it was not without danger, as Gladys MacDonald’s story underscores, especially when it was perceived as a direct challenge to the authority of the state. Wartime, in MacDonald’s case, provided the government with the perfect excuse to silence her and others who dared to contest the lot of the working class. Rhonda L. Hinther is an Associate Professor of History at Brandon University (BU). Her research and teaching interests include public history, oral history, gender and women’s history, migration and labour history, and radical and social justice activism in Canada. She is the author of the forthcoming book, Perogies and Politics: Radical Ukrainians in Canada, 1918-1991 (University of Toronto Press, 2016) and the co-editor of Re-imagining Ukrainian-Canadians: History, Politics, and Identity (University of Toronto Press, 2011). “4 Persons Rounded Up In Regina Raid,” Medicine Hat News, June 6, 1940; “Sask. Trio Held Under War Act,” Winnipeg Free Press, June 3, 1940; “War Act Violators Sentenced to Jail,” Winnipeg Free Press, September 12, 1940; Joan Sangster includes some discussion of Macdonald and several of the other leftist women arrested at this time – see Joan Sangster, Dreams of Equality: Women on the Canadian Left, 1920-1950 (Toronto, Ont. : McClelland & Stewart, 1989). For more information on women internees and other women (of varying circumstances and political stripes) rounded up seemingly without rhyme or reason under the DOC Regulations, see Michelle McBride’s path breaking article, “The Curious Case of Female Internees,” in Enemies within Italian and Other Internees in Canada and Abroad, ed. Franca Iacovetta, Roberto Perin, and Angelo Principe (Toronto; Buffalo: University of Toronto Press, 2000), 128–47. On page 164, McBride provides important commentary on McDonald’s wartime circumstances.